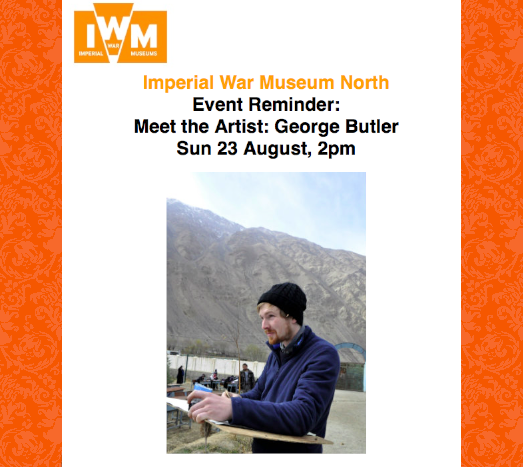 Yesterday afternoon I attended George Butler's 'Meet the Artist' event, at the Imperial War Museum North, to find out more about his WithDraw exhibition that I recently visited and even based my summer A Level project on! I booked my tickets shortly before visiting his exhibition, with the Henshaws Art Galleries and Museums group, and you can read the blog post about my original visit to the exhibition here! 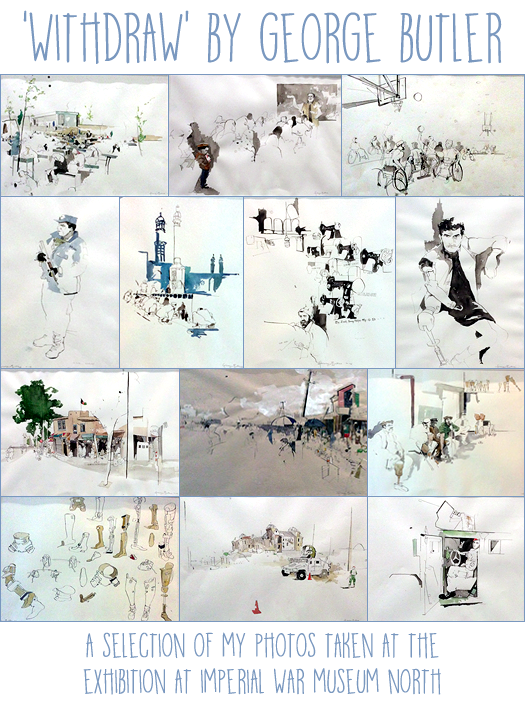 Renowned reportage illustrator and journalist George Butler visited various parts of Afghanistan, during the drawback of International troops in late 2014, and documented his time spent there - visiting different locations and meeting new people - through his illustrative pen and ink drawings that are featured in WithDraw. 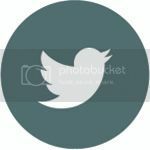 Pieces include portraits of soldiers and day-patients at a hospital, landscapes of schools, mosques and villages and market streets opening up for the day, including one solely dedicated to the selling of birds! 'Meet the Artist' provided the unique opportunity to find out the meaning behind his visit to Afghanistan - telling different stories to the ones we regularly see on the front of a newspaper - where George shared his personal stories and photos behind each piece and even provided an interesting insight into the experience of his drawing process, completely in-situ with large crowds gathering behind him, through personal videos. After George's presentation I had the chance to ask a question, regarding my A Level summer project, on how he would recreate some of his pieces if he had to use unorthodox materials. I also had to have a photo taken with him as I'm so familiar with his work now after spending the past few weeks experimenting with different materials and recreating some of his work in my sketchbook! @Glittered @SuzanneShoker1 @IWNorth Good to meet you to, always like manchester! I had a wonderful time at the event and would like to thank George Butler for sharing his journey with the audience and for being such a pleasure to meet! Also a big thank you to the Imperial War Museum North, as always, for being so accommodating and helpful to my Guide Dog and I.
I visited the Imperial War Museum North recently, with the Art Galleries and Museums group from Henshaws, where the overall theme of this month's visit focused around the emotional aspect of 'the effects of conflict and war on people in their homes'. The visit was split into three sections; first exploring the WithDraw exhibition by George Butler, before moving onto a touch and handling session of historical Blitz and Rationing items from the Second World War. Audio description was provided by Carisse Foster, Martin Skelton and Helen Grice who lead the sessions. The visit was arranged by Camilla Thomas and Rosemary Mawdsley. During the first session, in the Waterway exhibition, the group and I looked at journalist and leading reportage illustrator George Butler's works based on his time in war-torn Afghanistan. He visited last year, in 2014, in the weeks following the drawback of International combat troops after 13 years of conflict. Butler's pen and ink drawings offer a compelling insight into a country living with high levels of tension. His style of art is very similar to that of an urban sketching technique, something I have been interested in experimenting with for a while, and all were created live, 'in-situ', on the streets of Afghanistan. Most of his pieces are accompanied with his own thoughts and memories printed underneath, revealing the impact of the past 13 years on people, communities and society. There are twenty exhibits that make up WithDraw, with subjects ranging from people to prosthetics, hospitals and schools, countryside and market streets. All were created using a dip pen and ink on location, and later filled in with watercolours back in the studio. From the exhibition: "George believes that reportage illustration is as valid, viable and as powerful as photography and film in recording today's news. As an artist and illustrator he is free to interpret the elements that inspire him and sees drawing as a way to offer the viewer a different angle. His drawing is an open process that anyone can view over his shoulder and, he finds, is a sensitive way of capturing very emotional subject matters." The WithDraw film is available to watch at the exhibition providing a behind-the-scenes insight into how the series of drawings were created in Afghanistan, like a video diary and personal journey. The film is also featured on George Butler's official website landing page, here. 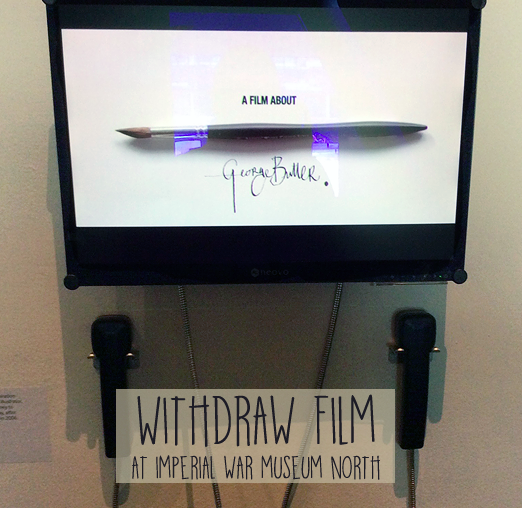 You can find out more about WithDraw, with an upcoming 'Meet the Artist' event with George Butler, on Sunday 23rd August 2015, at the Imperial War Museum website here. 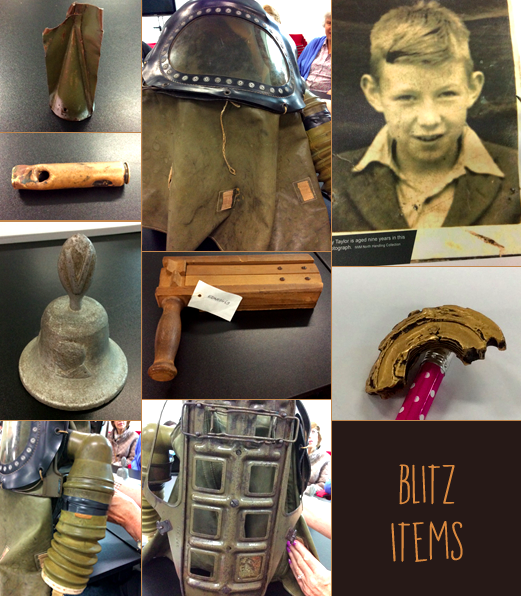 The next session in our visit focused around a touch and handling element of historical items from World War 2; particularly collections pertaining to the Blitz and Rationing. As I'm basing my A Level project on this visit I wanted to create Frottage impressions, using a pencil and paper, to get an idea of some of the different surface areas and textures of these items to incorporate into my own research. We first looked at shrapnel and rubble collected by nine year old Roy Taylor, in his home area of Manchester during the Blitz. Items included brick, slate, shrapnel and cartridges that he found among the rubble and would have played with. These items were cold to the touch, some smooth and dull like the cartridge and others with sharp pointed edges. Also passed around was a metal Victory Bell moulded from fallen German aircraft, a wooden ratchet (or hand rattle) to alert communities of gas attacks, and a baby's gas mask that covered their entire body. This was my favourite object in our touch and handling session and the sheer weight of the thing was astounding! The mask acted more like a casing, completely encompassing the baby when all of the covering straps and flaps were closed up. Fresh air was pumped in using a hand pump on the right-hand side, that filtered the air ensuring no gas was inhaled. A cage on the back was used to hook baby onto the wall and out of the way - though they would still need fresh air pumped in manually 24 hours a day! Many of these masks were made in Manchester by P. Frankenstein & Sons. 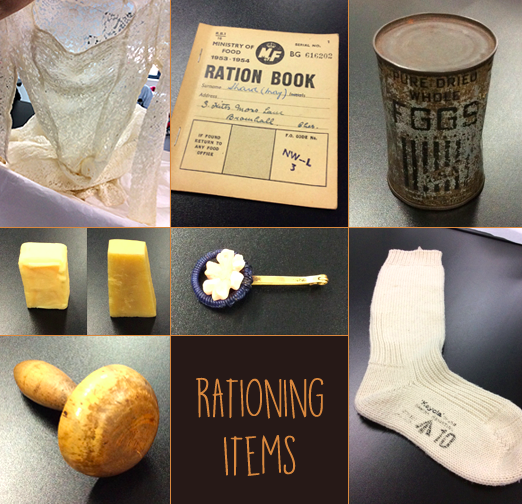 To end the touch and handling session, and our visit, we looked at various items of Rationing belonging to a Manchester couple who married during the Second World War. The wife's wedding dress was passed around first, which incorporated beautiful lace detailing and a scalloped neckline with pointed V sleeves. This would have been passed down from bride-to-bride through the generations, just one example of rationing. We also looked at the husband's heavyweight sock that he wore whilst in the Royal Navy. This seems to be a Government-made sock as the stitching is perfect, but many women across the country would have banded together to created garments for soldiers. A darning mushroom was used to repair socks seamlessly, so that nothing ever went to waste and was thrown away - another example of rationing. Ration books of the married couple, example food portions, canned dried eggs, and a brooch made from a button and telephone wire were also among the collection of rationing items. These were truly frugal times, people had to be creative when restoring or creating items and this is something that has been lost over the generations as we now tend to throw things out and purchase new items. I thoroughly enjoyed my visit and look forward to working on my A Level summer project with this research! I'd like to say a big thank you to Mary Gifford, Mary Tantrum, Carisse Foster, Martin Skelton, Helen Grice, Camilla Thomas and Rosemary Mawdsley for a well-organised and informative event! 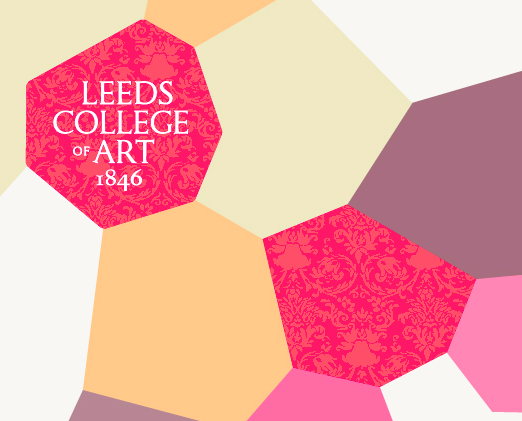 Leeds College of Art Update! Hi everyone! 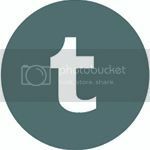 A lot has been happening recently, hence my absence from my blog, so I wanted to share a quick update about my funding for college, the kind donations I have received and recent course change to keep you up-to-speed! First of all I want to say a massive thank you to everyone who donated through my GoFundMe page; I received an amazing £810 altogether and to have received such a large amount of money in such a short space of time means the world to me. I also received £1,130 in physical donations from family members and service users at Henshaws - bringing my final total to £1,940! 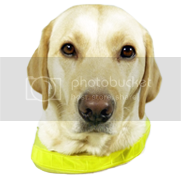 I'm so incredibly grateful for everyone's generosity which will certainly help my Guide Dog and I feel much more comfortable financially, in terms of accommodation and travel, during my first year at the Leeds College of Art. Being in a different city, away from home, is not going to be cheap (travel expenses and accommodation alone will come to over £4,000!) and you have made such a difference to how this next chapter in my life is going to start out. As you may recall, I wanted to start college education right at the beginning, starting with a Diploma in Visual Arts (or Level 2) course before moving onto my A Level, Degree and even Masters in the future. I received a phone call recently from my tutor that he would prefer me to undertake the A Level course, rather than the Level 2, as I already have an A* in my GCSE's and he felt the course wouldn't be of much benefit to me. Despite not being my first choice, I agreed to the offer to join the A Level / Level 3 course and have responded to my Letter of Acceptance! I'm now in the process of applying for a 24+ Advanced Learning Loan for the course, as it costs £3,980 for the year, which is of course more expensive than the Level 2 course I originally wanted to undertake. With accepting the A Level offer I now have a Visual Studies summer project to complete over the next few weeks before enrolling on September 2nd and starting the course proper on September 10th. The aim of the project is to visit an exhibition and research with unorthodox materials and text to explore new methods and understanding of form, shape, mass and surface area. I am basing my project on the WithDraw exhibition, by reportage illustrator George Butler, at the Imperial War Museum North (blog post coming soon!). Thanks to my kind donations I have booked my accommodation through a website called homestay.com, where I will be staying with a "host family" until Christmas. This option is much more affordable to me, at £24 a night, and I will be staying with John, Thery and their two little girls until the festive period. 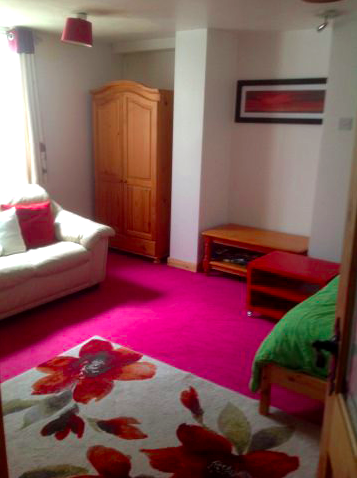 Tami and I will be staying in the furnished basement room for 3 nights a week and I very much look forward to meeting my second family and staying with them over the next few months! I'm really excited for September and this new chapter in my life, and again want to say a huge thank you to everyone who donated to me! I shall keep you all updated on my enrolment day and first few weeks of college when the time comes! After my work with the Greater Manchester Police and Crime Commissioner last year, I receive regular e-mail updates regarding the work of my local police and emergency services to keep informed of the latest news and developments around my local areas of Salford and Manchester. 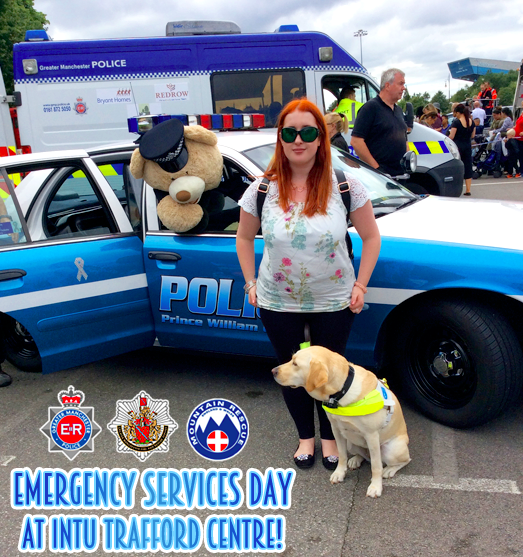 I was notified of an upcoming 999 Emergency Services Day, its fifth annual event to date, at intu Trafford Centre yesterday; so I thought I would pop along and learn more about our amazing community protectors, from firefighters to police, mountain rescue to the ambulance service! Tents lined to entire Orient car park with models of police cars and fire engines, both old and new, open and available to sit inside of and sound the sirens! A children's fire engine, Volunteers, fundraisers and staff of each service were on hand to speak to and ask questions - and a there was even a live demonstration of the fire rescue team saving someone trapped inside a vehicle. I particularly enjoyed this as it was audio described by a member of the fire crew via a microphone and speakers, so his commentary could be heard across the car park and I knew what was happening despite not being able to have the visual clues that other sighted attendees would have. 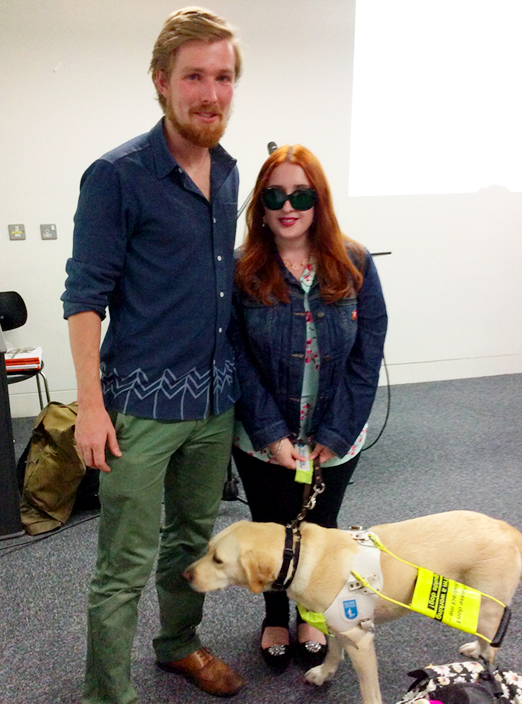 Tami and I were like our own walking exhibition at the event; with photographers taking photos of us both and children lining up to stroke a working Guide Dog! There were huge crowds and distractions aplenty but Tami did a wonderful job guiding me through hundreds of people and we had a great time! 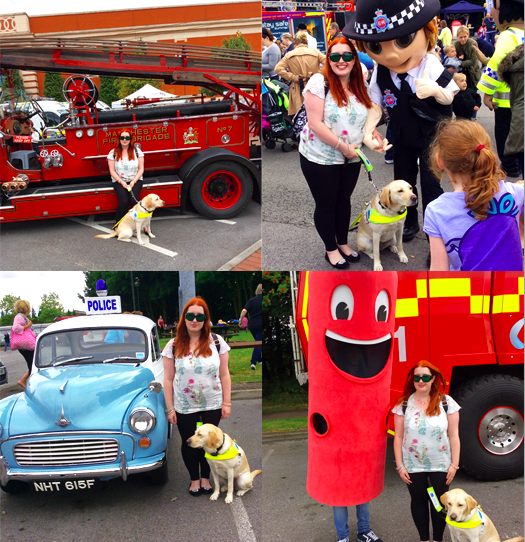 You can read more about the Emergency Services Day and the full list of displays here at the Greater Manchester Fire and Rescue Service website! 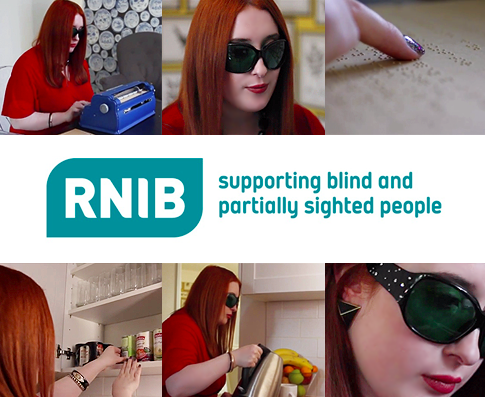 I have a variety of exciting things to share with my readers that I have been involved in with the RNIB since my photoshoot earlier this year; from product videos, to an appearance in the Vision magazine, thank you gifts and even being featured on the official RNIB Facebook banner! Take a look below at some of the projects I've been involved in throughout the year! Earlier this Spring, I filmed new product videos with the RNIB for their online store; demonstrating how I use the liquid level indicator and Perkins Brailler with corresponding labelling tape adapter. I have now received the final edited videos and have provided a useful transcript underneath each clip. 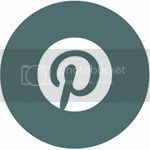 "The liquid level indicator is a device that hooks onto the side of a cup or mug. It has 3 prongs, that are metal, that helps to detect when the water is nearing the top of the cup. 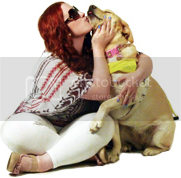 I'm Kimberley Burrows, I'm 26 and I was a premature baby and my Optic Nerves didn't develop properly. If I didn't have my liquid level indicator then I would certainly be having a lot more accidents! It just gives me a bigger sense of confidence around my kitchen. One thing that's great about the liquid level indicator is that it's magnetic; so I keep mine on the side of my fridge so that I know where it is and don't end up losing it! I use my liquid level indicator for pouring every drink, whether it's hot or cold. When the water is nearing the three prongs it will vibrate and beep - so it's dual-sensory in that it's audio and touch as well. There are two levels; when it's coming to the first level it will be quite moderate in its vibrating and beeping, and nearing the top it's time to stop then. The liquid level indicator is an example of something simple that can make a huge difference. Visit RNIB's shop for more ideas at rnib.org.uk/shop"
"I first used a Perkins Classic Brailler a few years ago. It's quite easy, just like writing, and it just flows out really! 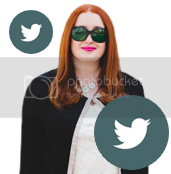 I'm Kimberley Burrows, I'm 26 and I was a premature baby and my Optic Nerves never developed properly. I first discovered the Perkins Classic Brailler when I starting doing a Braille course. When I first used the Brailler it was just amazing and it opened up a whole new world of communication for me. I personally use it to write stories and jot down notes and I also Braille my labels. There is a label adapter that I add to the back of the Brailler which feeds through the same way as a piece of paper would. This allows you to then feed tape through and Braille onto the tape to cut off to add to cans, DVDs or CDs. If I didn't use my Brailler to label soups that it could end quite disastrously! I could be getting something completely different out of the cupboard - it could be dog food! So it saves me from humiliation, really. It helps to me spotlight a certain item and I just need that independence. The Perkins classic is one type of Brailler that's available from RNIB's online shop. 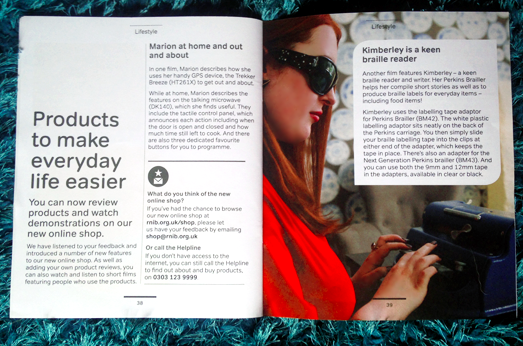 Visit rnib.org.uk/shop"
Over at the RNIB online shop I can be seen heading the Braille products, with additional photos under the Perkins Classic Brailler! 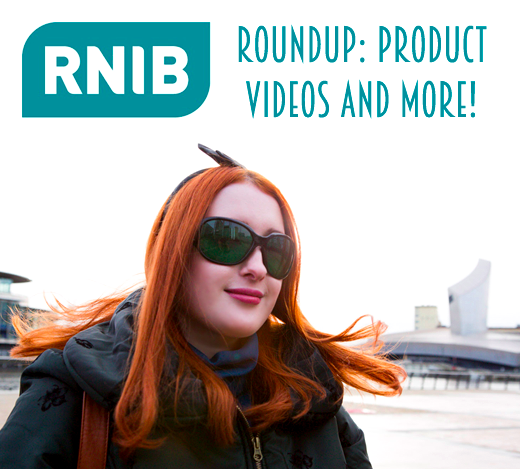 You can view the full range of products available by the RNIB, from magnifiers to lighting to talking products, by visiting their online shop. 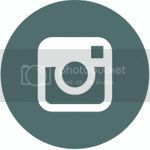 "Products to make everyday life easier: You can now review products and watch demonstrations on our new online shop! We have listened to your feedback and introduced a number of new features to our new online shop. 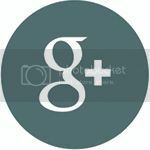 As well as adding your own product reviews, you can also watch and listen to short films featuring people who use the products. 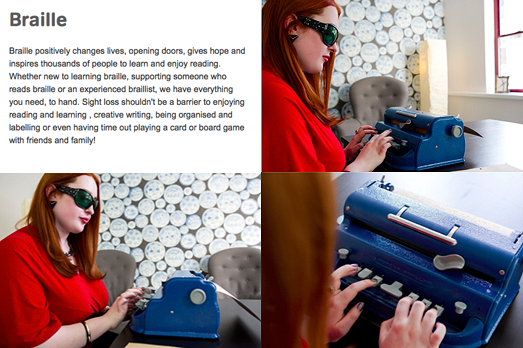 Kimberley is a keen Braille reader: Another film features Kimberley - a keen Braille reader and writer. Her Perkins Brailler helps her compile short stories as well as to produce braille labels for everyday items - including food items! Kimberley uses the labelling tape adaptor for Perkins Brailler (code BM42). The white plastic labelling adaptor sits neatly on the back of the Perkins carriage. You then simply slide your Braille labelling tape into the clips at either end of the adaptor, which keeps the tape in place. 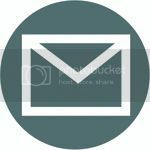 There's also an adaptor for the Next Generation Perkins Brailler (BM43) and you can use both the 9mm tape and 12mm tape in the adaptors, available in clear or black." 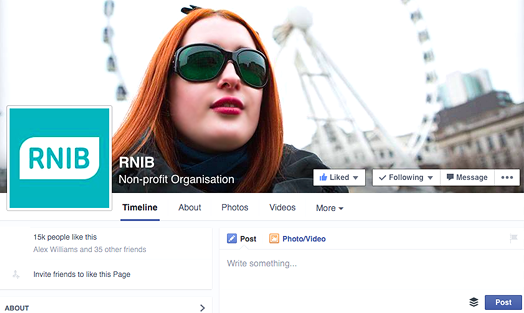 I'm very honoured to currently be featured in the RNIB's Facebook page banner! 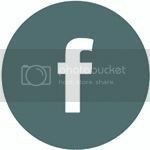 It's a huge privilege to be the first thing that many visitors see when they visit the social networking site and means very much to me, indeed! 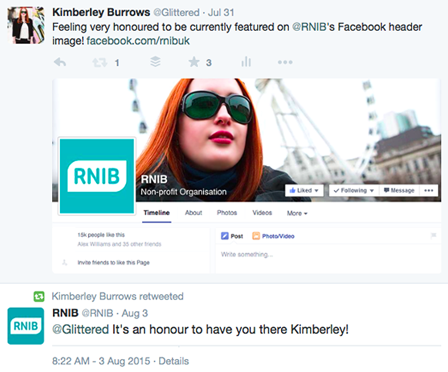 from RNIB's Twitter page too! ...And finally! 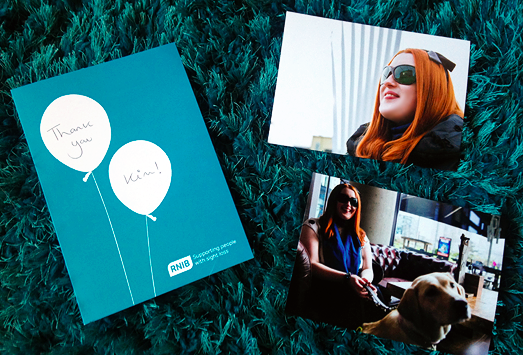 I have received some wonderful gifts from the RNIB as a thank you for taking part in their projects this year; including a card with a handwritten thank you note from the team I worked with as well as two prints of my photographs taken at MediaCity UK in Salford Quays! 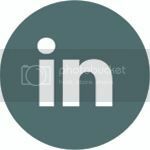 I really enjoyed filming my product videos and taking part in photo sessions for RNIB and would like to thank them for inviting me to be involved with their projects!